iMovR's innovation of the SteadyType keyboard tray finally sets the ideal ergonomics for all three modalities: sitting, standing and walking, in this rock solid, top-of-the-line electric desk. With the special angles and overall stability achieved by embedded the keyboard tray into the desktop user productivity soars. The bottom line is faster and more accurate typing, and greater comfort due to the improved ergonomics as compared to conventional desks and trays. For treadmill deskers the additional ergonomic benefit of eliminating "palm anchoring" stresses means faster typing at higher walking speeds and a healthier workstation setup overall. The Everest is the ultimate desk, a clean-sheet ergonomic design specifically for standing and treadmill deskers, not just for when sitting. Standard shipping cost of $99 in the continental United States. Additional charges for AK, HI, Canada. DHL available for international. Your customized desk ships within 5-7 days of order. Add up to 5 business days for freight delivery anywhere in the continental US. iMovR offers an unparalleled warranty, reflecting their confidence in the all-American manufacturing quality of this desk: Lifetime on steel frame, 10 years on moving parts, 10 years on electronics, and 5 years on tabletop. The table tops can be ordered in any of eleven standard finishes: Clove Mahogany, Light Maple, Hayward Cherry, Shaker Cherry, Almond Cherry, Urban Walnut, Designer White, Warm White (Beige), Haute Gray (Putty), Black, and a handsomely corporate Shark Gray. 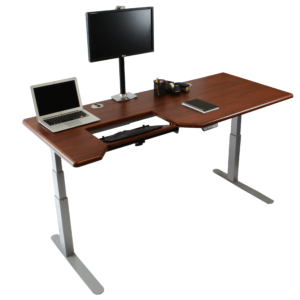 The Omega Everest is the ultimate adjustable height desk to use standing, sitting or walking. 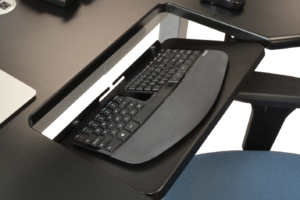 It pairs the ThermoDesk Elite's electric-adjustable base with iMovR's proprietary SteadyType embedded keyboard tray. The platform surpasses any other desk on the market in terms of ergonomic adjustability, rock-solid stability, and typing productivity. the SteadyType tray's ability to work at any tilt angle is not only more ergonomic and comfortable, it'll increase your typing speed and accuracy. If you're a treadmill desker, the elimination of "anchoring stresses" makes the Omega line a superior choice compared to any other desk on the market, and will allow you to type faster at faster walking speeds, with far less shaking. Reduces the amount of space you have on your desk: if you spend a lot of time writing, get a larger model with more flat space. The keyboard platform does not work well with certain "tenting" keyboards like the Kinesis unless laid flat, but does work with 99% of keyboards otherwise. There is a less pricey option with the Omega Denali if you're willing to go with a manual (crank) base versus the Everest's electric base. Without parallel, the iMovR Everest is the most ergonomically advanced standing desk on the market today. Made in America to the most exacting manufacturing tolerances it combines exceptional performance and reliability with the appeal of 3D laminated surfaces, and the ergonomic advantages of one or two built-in SteadyType keyboard trays. The iMovR Everest has been discontinued. iMovR's newest model, the Lander Desk, features the same premium build-quality as the Everest, with an easier assembly process and an app-compatible controller. Commercially-available treadmill desk workstations have only been in the market for a few years. In that time we've seen the industry transform right before our eyes, more standing and treadmill desk products have come on the scene; and new active furniture and devices - like desktop risers and leaning seats - have gained in popularity. We've also seen a dramatic shift in the technology behind stand up desks and the walking treadmills underneath them. Far from the clunky, noisy, and expensive desks of yesteryear, many of today's standing and treadmill workstations are sleek, sophisticated, and affordable on just about any budget. But one component that hasn't changed in all this time is the table top itself. While standing desk bases have become quieter and more reliable, and while electronic controllers have added more bells and whistles, table tops have remained largely the same. Some manufacturers have designed ergonomic monitor arms, keyboard trays, and other peripherals to customize your desk. Others have made significant improvements with installing table tops, such as with iMovR's ThermoDesk Elite's pre-drilled inert nuts. But the general shape of the table top has not improved much in the switch from sitting desk to treadmill desk. iMovR is looking to change all that with Omega, their new line of standing desks and treadmill desks. 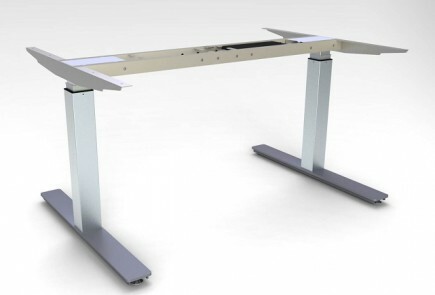 The Omega Everest Standing Desk (electric adjustable model) retains several impressive features of iMovR's ThermoDesk Elite, kicking the table top to a new level and raising the bar for office ergonomics. Manufacturers of sit to stand desks and treadmill desks have been relying on decades-old assumptions about the proper positioning of hands over keyboards for minimizing RSIs (repetitive strain injuries). Little research had been done on whether those assumptions still hold up when typing while standing or walking. According to iMovR's research, there are many nuanced differences. They claim their novel Omega design addresses those differences better than any other desk, including ones equipped with a conventional keyboard tray. Most treadmill deskers come to find that using a treadmill desk poses a set of new challenges when it comes to typing while walking. Some examples are the hand, wrist, forearm, shoulder, and neck strains that afflicts every user to some degree. This is especially bad for newbies still getting used to their treadmill and for highly-committed walkers who will spend four or more hours a day treading. When walking on a treadmill; even as slowly as we do in the 1 to 2 mph range, we tend to ‘anchor’ ourselves to the work surface while we type - pressing down hard on our palms for stability and to maintain hand position over the keyboard - as the treadmill belt constantly pulls us away from our desk. Typing in this "closed loop" posture for long periods of time can put undue strains on the muscles and tendons in our wrists, arms and shoulders, potentially resulting in carpal tunnel, rotator cuff soreness or even low back pains over time. That seems fundamentally counterproductive when we're using these devices to improve our health and productivity in the first place. This is why we've always recommended using an adjustable keyboard tray when working while walking. Trays like the Humanscale Keyboard Tray System, Humanscale Float Tray and ThermoDesk Stowaway can be adjusted to a negative angle that places the wrists in a more neutral position, reducing flexion and extension (cranking of the wrists). But these peripherals tend to be cumbersome, difficult or impossible to install, and costly. Not to mention, they force your body to be 10" to 14" farther away from your desk and monitor. These keyboard trays also act as levers attached to your desk, translating and magnifying the oscillations your body makes when you walk. Even small vibrations from your typing can create a distracting amount of shakiness in your monitor - especially if it's hanging on the end of a monitor arm (as it should be) and more so if you’re particularly tall or heavy-handed. Some users minimize the instability in their treadmill desks by using a variety of tricks, but many just have to make peace with a slightly wobbly workstation. The taller the user, the worse it can get. What sets the Omega above other adjustable height stand up desks is its built-in, infinitely-adjustable keyboard platform, which they're calling the SteadyType. The front edge of the table top opens up into a cutout shaped like the Greek letter omega where the user is positioned. 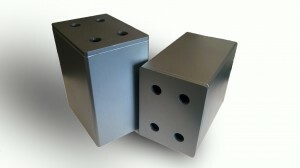 Here, a rectangular portion of the desk is sectioned off from the table top and attached to a solid steel pivot bar running underneath. Knobs on the underside of this platform loosen or tighten the attachment, allowing the platform to tilt forwards or backwards a full 90 degrees in either direction. In contrast, traditional ergonomic keyboard trays typically have a very limited incline adjustment range of +5 to -15, or at most -20 degrees. The Omega's unique feature results is an unprecedented keyboard tilt adjustment range – a major advantage, as we soon found out. Leader of the pack is the Omega Everest, which pairs the revolutionary new table top and integrated keyboard platform that defines the Omega with a premium, heavy duty electric adjustable base (the same as is used in iMovR's ThermoDesk Elite). 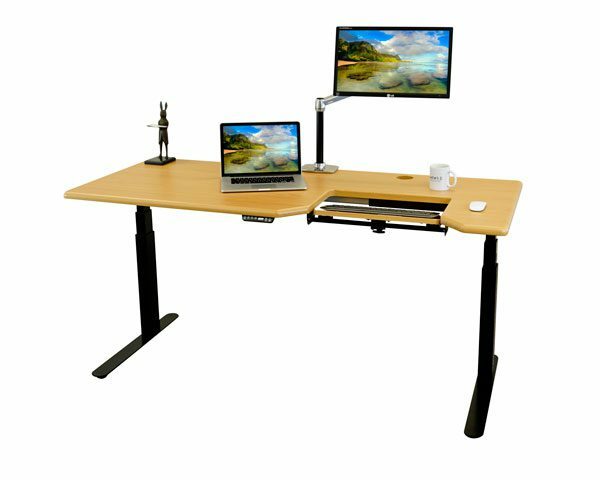 What results is a complete sit-stand-walk workstation that gives users improved ergonomics and stability no matter at what height configuration a user chooses. Installation and assembly of the Everest is straightforward and the documentation is very clear (note there is also an option to order the Everest pre-assembled at the factory). The base comes with two lifting columns, each with its own precision Bosch motor that adjusts the telescoping leg segments; and a width-adjustable crossbar to connect the two. Attaching the base to the table top is as simple as lining up the base with the underside of the table top. The nice thing with all iMovR desks is that their base widths are telescoping, so if you ever need to change desk sizes in the future you can just swap out the top (the far less costly component of the desk) and reset the base width. While some other desks provide pre-drilled pilot holes for installation, the Omega takes it a step up with their recessed insert nuts and easy-insert machine screws, which removes the mess of drilling into wood and protects the table top as you attach the base and keyboard tray mounting hardware to the top. The only pre-drilled holes are for the three small screws used to mount the hand controller. You can choose to mount the controller on the left or right, or in the case of the 72" or 83" tabletops, the center. The integrated keyboard tray creates a "cockpit" feel that is both ergonomic and aesthetically dramatic. The keyboard platform is contained in a cutout that gently dips inward, giving users easier access to the table top. Most table tops comprise a standard high-pressure laminate top and PVC or vinyl strips around the edge. iMovR’s signature 3D lamination process envelopes the MDF table top and the separate keyboard platform, making them impervious to moisture damage. It also allows the tables to achieve gently-sloping edges and rounded corners for a more comfortable top than standard standing desks. The 3D lamination also preserves the woodgrain design over edges, inside grommet holes, and around corners on the thick 1.125” table top. In our testing, we found the Everest Stand Up Desk easy to use and difficult to step away from. The electric height-adjusting base moves quickly - at 1.5 inches-per-second travel speed - and quietly - at 42 dB in descent and 46 dB in ascent - with an impressive lifting capacity of 265 lbs. (If you're curious about how important lifting capacity is, check out our article "Do Weight Ratings on Electric Desks Really Matter?".) You can also either adjust the height of the desk with the up/down buttons, or you can set up to four programmable preset heights for your desk. Save your preferred standing, sitting, and walking heights to easily switch throughout the day. Where most standing desks have a height limit of 48", the Everest has a maximum height of 50.5” (including the desk top), making it tall enough for just about anyone to use, with or without a treadmill. The keyboard platform measures 19.5” x 10.5”, roomy enough to accommodate most any keyboard (with the exception of a few rare gamer keyboards that won't likely fit on any keyboard tray). It’s attached to a pivot bar underneath and easily secured at any typing angle by twisting a wide rubber knob. iMovR had the forethought to include sliding pegs that keep your keyboard in place – you can adjust the keyboard tray as steep as you want without worrying about your work literally getting away from you, keeping the keyboard as close to your body as possible to minimize computer hunch. There is also adequate space beside the tray for your mouse or other peripherals, coming in handy for keeping your mouse close to you. There are two height settings available on the keyboard tray’s mounting bracket. One that is set at 3/8" below the surface of the desk, the other at 1-1/8". Of course, the tilt angle and depth of the keyboard platform affect the net difference in height between typing and mousing. In our tests, we were able to always achieve the ergonomic goal of minimizing the extension of the upper arm when mousing while keeping our hands within a consistent "arc" around the body. These dramatic angles are even more important to deskers who walk on a treadmill. Rather than pressing down on a flat surface and increasing the pressure on the wrist, users were able to anchor to the keyboard platform while keeping their arms at neutral angles. Users also retained access to more of their desk without a keyboard tray pushing them a foot away. With the keyboard platform built directly into the desk; close to the center of balance, we experienced almost no shakiness, even when typing deliberately forcefully. 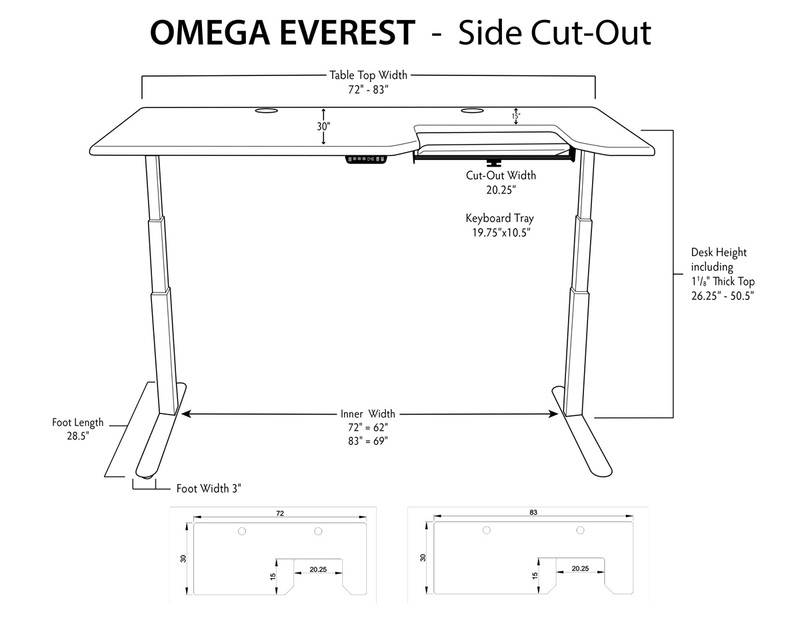 Like the Elite, the Omega Everest Stand Up Desk is available in widths of 48", 60", 72" and 83". On the two smaller widths the keyboard tray "cockpit" is centered. On the two larger widths the cockpit can be set on the left, right, or center of the tabletop. There is also a dual-tray version available in the 83" width, for the ultimate sit-stand-walk configuration; one cockpit on the left, one on the right. A single grommet hole is provided on the 48" top; the three larger sizes come with two grommet holes standard. The 3" holes are fully-wrapped in 3D lamination, showing off the all-natural hardwood look of the desk. iMovR also offers a grommet-mounted dual-AC power node that fits neatly in one the 3" grommet to conveniently bring laptop and cell phone charger plugs to the tabletop. This is a great feature for any multi-user workstation setup, in particular. Whether you’re standing, walking, or sitting, the Omega Everest’s keyboard platform protects your wrists and keeps you closer to your desk. With the same comprehensive warranty as the ThermoDesk Elite, you have years of strain-free typing to look forward to. If you’re intrigued by the unique table top design of the Omega, but would prefer a manual desk, you can check out our review of the Omega Denali. Acclaimed author John Robert Marlow is an iMovR Everest Standing Desk user, and he writes about his experience with the desk here on his blog. For more iMovR testimonials, see the reviews page on iMovR.com. 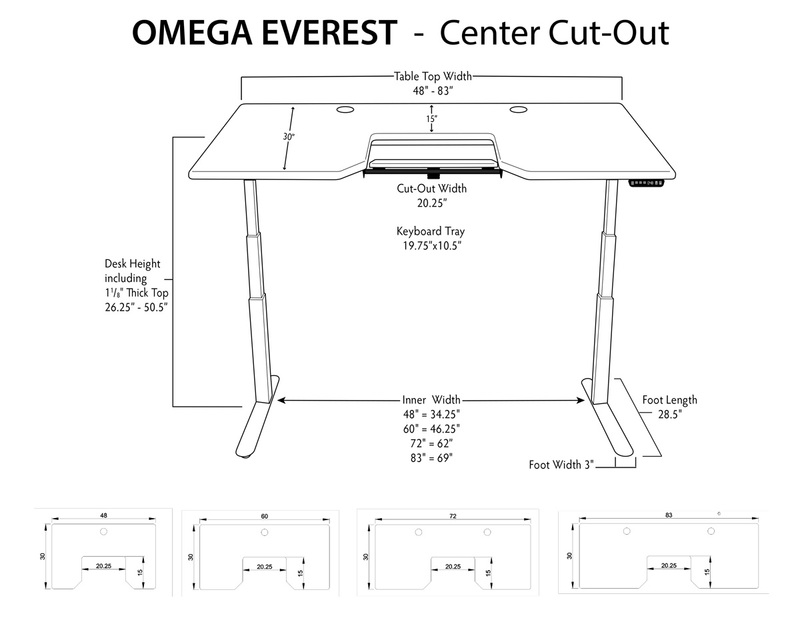 The Omega Everest tabletop is available in 48", 60", 72" and 83" widths (30" depths all around). 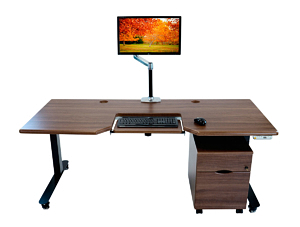 The 72" and 83" widths are ideal for sit-stand-walk work configurations in which a full-sized office chair and a treadmill can co-exist side-to-side. The keyboard tray "cockpit" is in the center of the 48" and 60" tops. On the two larger sizes the cockpit can be cut in the left, right or center of the table. The ultimate is the 83" dual-cockpit setup where there's a dedicated tray for the treadmill as well as for the chair. The table tops can be ordered in any of eleven standard finishes: Clove Mahogany, Light Maple, Hayward Cherry, Shaker Cherry, Almond Cherry, Urban Walnut, Designer White, Warm White (Beige), Putty, Black, and a handsomely corporate Shark Gray. A desk accessory that we highly recommend is an adjustable monitor arm. These devices allow you to keep your screen at ergonomically-comfortable positions, reducing the strain on your neck and shoulders and allowing you to be more productive at your desk. An LX Tall Pole Monitor Arm is perfect for sit-stand desks, and the new Sit-Stand Monitor Arm has an extra wide reach to swing between the sitting side and walking side. Storage can be a bit tricky for adjustable height desks: drawers can interfere . Thankfully, an optional mobile file cabinet provides abundant storage space for your desk. It's equipped with four caster wheels—including two locking ones—that allow you to easily reposition it wherever you need. This heavy-duty file cabinet is finished with the same 3D lamination technology that envelops your table top. This makes it resistant to scratches and dings, and also guarantees that your file cabinet matches your desk. Three inch grommet holes are standard on all Omega desks - one on the 48" desk and two on desks 60" or wider. These grommet holes are perfect for organizing the various cables that run over and under your desk. Alternatively, a dual AC grommet-mounted power node can be installed in the grommet, ideal for shared workstations. These power nodes allow you to charge your phone or laptop without needing extra long cords for all your devices. 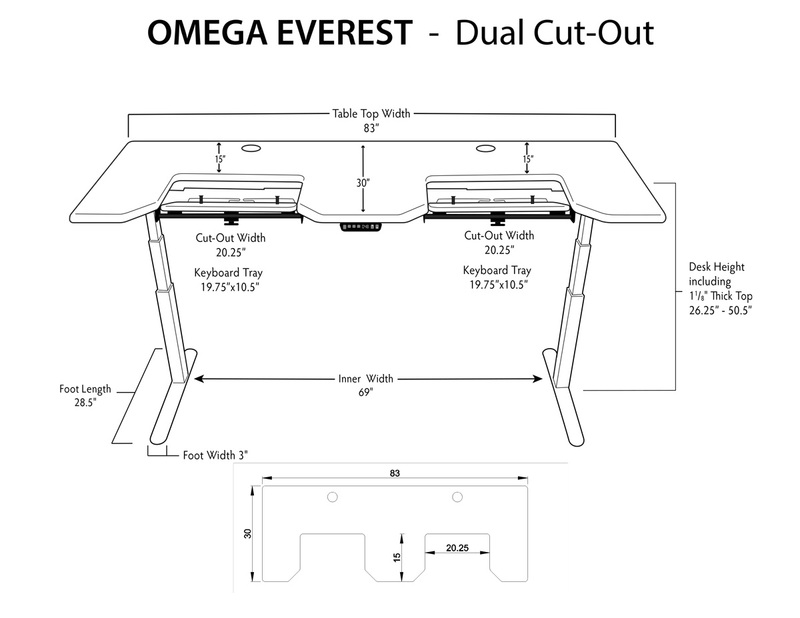 The Omega Everest's maximum height of 50.5” already exceeds the ANSI/BIFMA height standards for adjustable height stand up desks by 4 inches. And the SteadyType keyboard tray's unique typing angles mean you type at far below elbow height. 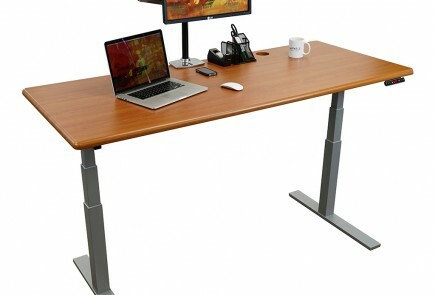 Nonetheless, users who want a little more height with their desk need only turn to the Everest's optional leg extensions. These attachments add an extra four inches to each leg, bringing the Everest's maximum height to a lofty 54.5". 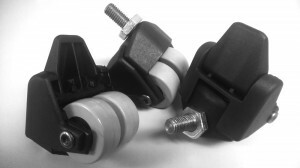 Users who want the ability to easily move their desk around, whether it's to quickly reconfigure your office or to access the space behind it, will want to invest in a set of optional caster wheels. These wheels glide easily along any carpet or floor, and can lock when not in use. Made of top-quality materials, these casters will never mar the floors. If you install casters we highly recommend the iMovR Advanced Cable Management Kit for keeping all your dangling cords neat and tidy as your desk moves around the office. Another thing we appreciate about iMovR's business model is their pre-assembly service. This has been very popular since they became the first (and still only) height-adjustable table manufacturer to introduce the option, and has also become a standard element of their white glove delivery option. While installation of the Omega desks is relatively quick and easy thanks to iMovR's easy-to-follow instruction manuals, some users may prefer to skip all that and get straight to working. If you elect to have your desk pre-assembled, it will arrive at your door ready-to-go. Simply flip the desk off the shipping pallet, raise the desk to your preferred height, and you're off to the races. With iMovR’s white glove delivery option you get the Omega pre-assembled at the factory, brought into a room of your choice, installed and plugged in, and all packing materials and the pallet hauled away. It’s a truly hands-free service that takes nearly all the work out of installation. The high rate of shipping damage to furniture items shipped by UPS or FedEx is well known, and it's a huge hassle for both the recipient and the manufacturer. iMovR prefers to avoid these issues by using freight carriers instead of parcel shippers. They ship their thoroughly-packaged Omega Desk on a pallet for a flat rate of only $99. While freight shipping is a little pricier than standard mail carriers like UPS Ground, it is worth it to make sure your desk arrives on time and in perfect condition. This flat rate includes the base, top, and any other options ordered at the same time, such as monitor arms or power nodes. The Omega Everest comes with unparalleled warranty coverage: a lifetime warranty on the steel frame, 10 years on the moving parts, 10 years on the electronics, and 5 years on the table top. Check out our comprehensive Standing Desk Comparison Review for side-by-side feature comparisons with competing desks. I recently started my search to find an adjustable-height desk, to replace my corner desk I had for over a decade. 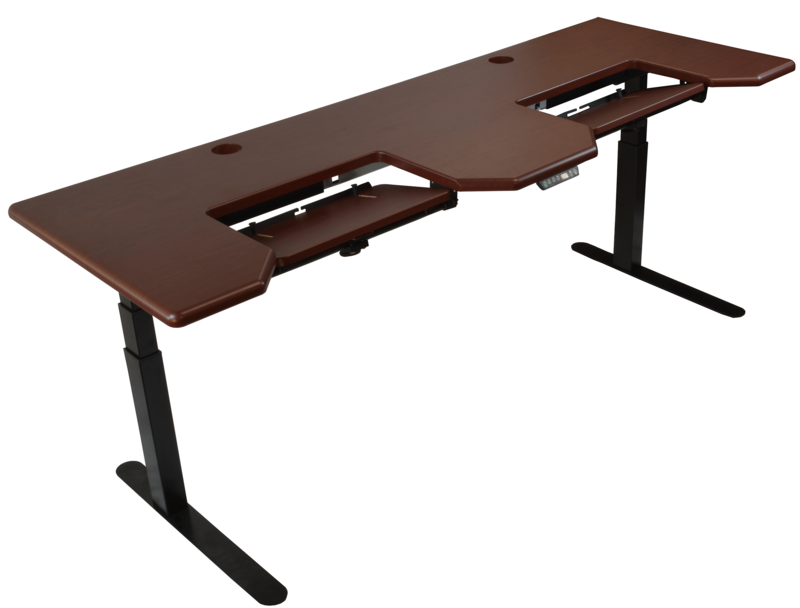 During my research, I saw great reviews on the iMovR Omega Everest electronic adjustable desk. I went online to read more, then had an online chat with Eric Weber, their Workplace Wellness Solutions Specialist. Eric answered all my questions and invited me to “test drive” desks in their Bellevue showroom. I had a business trip planned to Seattle, and took time to visit their showroom, where they had numerous desks on display, including competitor’s models. I found the Omega Everest desk to be the sturdiest, smoothest and quietest in adjusting height up and down. During my visit, Eric introduced me to their CEO and others from the team. I felt very comfortable in ordering my Omega Everest desk from iMovR and selected their “White Glove” delivery. I was called to schedule time for delivery, and they brought the desk upstairs to my office, set it up and took away the crate and packing materials. I also ordered a walking treadmill with Eric’s suggestion, which got delivered at the same time. I’ve had my desk for a few weeks and absolutely love it! I track a few miles each day and find it the perfect desk to provide me a more active office experience. I would strongly recommend iMovR’s Omega Everest electronic adjustable desk to anyone looking for a quality sit-walk-stand option. A great product from a great company!